The beauty of Wales Trails is that there is no set route! There are plenty of wonderful cycle tracks all over the country but as yet no complete circuit of the Principality. The original route that Dave Lewis planned is shown in the map opposite but basically the route you take is up to you. In actual fact the route eventually taken was slightly different to this for a number of reasons, as outlined in the Wales Trails book, but the basic principle was the same. Dave’s idea was to start in his hometown (Pontypridd), head west (clockwise), use as many traffic-free cycle trails as possible, hug the coastline, detour inland slightly for some added interest, take in a quick ride across the sea onto Anglesey and then ‘pioneer’ a route north to south and eventually finish back in the same place. His route took in the following towns: Pontypridd, Margam, Swansea, Burry Port, Kidwelly, Carmarthen, Tenby, Pembroke, Haverfordwest, St David’s, Fishguard, Cardigan, Lampeter, Tregaron, Aberystwyth, Aberdyfi, Barmouth, Harlech, Porthmadog, Criccieth, Caernarfon, Holyhead, Bangor, Llandudno, Rhyl, Wrexham, Knighton, Hay-on-Wye, Abergavenny, Chepstow, Newport and Cardiff with many smaller villages in between. As time goes on Sustrans will no doubt create new trails and there will be traffic-free additions to this route but the basic aim should be to follow the coastline as much as possible (remember that Wales now has a National Coastal Path) and then criss-cross the border with England, touching Offas Dyke as you go around. 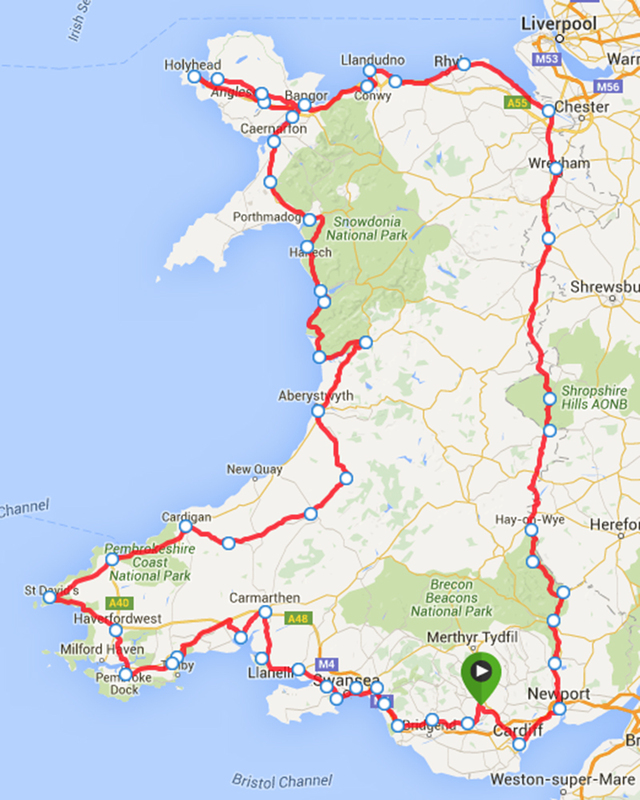 The route: Any loop of Wales you fancy! Duration: Take as long as you want, but we’d suggest two weeks or more to really get to know the country and it’s people! Direction: Clockwise, to take advantage of the SW prevailing winds and also ‘cos it’s a Buddhist thing! Start / Finish: You decide, it’s a loop after all so anywhere on the map is fine! Charity: Up to you, but why not set up a Just Giving page and raise some cash for a good cause? Aim: To put Wales on the ‘must do’ bikers list. The idea is to create a ‘LEJOG-lite’ in Wales. The famous ‘End-to-End’ ride usually takes two weeks and cyclists cover approx. 900+ miles. The lap of the Principality can be whatever you want but 500-700 miles seems about fair. This means the Welsh ride is shorter and therefore great training for the LEJOG challenge. This is your chance to put the land of the dragon firmly on the cyclists’ bucket list of adventures and also bring in some much needed income to the Welsh economy. Our B&Bs, bike shops, pubs, cafés and tourist attractions should all benefit! Wrexham – lager, lager, lager!